“Collectivism” also recalls some of the very worst communist ideas, including the “collectivization” of farms in the Stalinist Soviet Union — among the great atrocities of the 20th century (a crowded category). To progressives, the best thing about railroads is that people riding them are not in automobiles, which are subversive of the deference on which progressivism depends. Automobiles go hither and yon, wherever and whenever the driver desires, without timetables. Automobiles encourage people to think they — unsupervised, untutored, and unscripted — are masters of their fates. The automobile encourages people in delusions of adequacy, which make them resistant to government by experts who know what choices people should make. A couple of things here. First off, automobiles are not the only vehicles capable of encouraging “delusions of adequacy.” Bicycles, one might argue, are a lot more capable of encouraging such delusions — fueled as they are entirely by the body of the “unscripted” individual. Which is perhaps why they seem to enrage people in cars, who have to worry about gasoline and the like, so very much. Second, let’s talk about modern air travel. What mode of transport is more capable of sapping the human sense of possibility, more confining of the untrammeled human spirit? Perhaps before Will goes after high-speed rail, he should call for the defunding of the Federal Aviation Administration. But I do think this is a good look into the psychology of conservatives. Maybe high-speed rail is a waste of money and maybe it isn’t. I think it’s plausible to say we should just spend the cash on better regular mass transit or whatever. But I’ve long struggled to explain the right-wing’s affection for status quo American policies that amount to massive subsidization of the automobile. A small slice of that is spending on roads. A much larger amount is minimum lot size rules, parking mandates, the whole shebang. It’s a bit odd, and my instinct had been to say that this just goes to show that conservatism has nothing to do with free markets and everything to do with the identity politics of middle aged white suburban conformists. But Will offers another explanation here. Automobile use is not a sign of the free market, but an actual cause of it. Driving inculcates habits of freedom, and thus coercive pro-car regulations are, in a way, freedom-promoting. 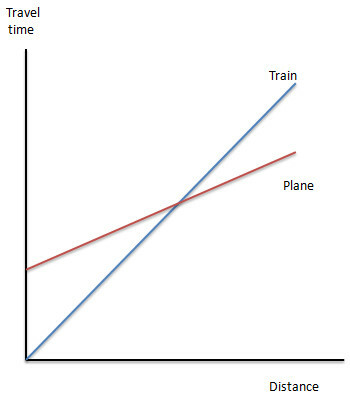 As Krugman says, trains really are the best way to travel, at least for travel times that are roughly competitive with air travel. That fact doesn’t automatically mean that therefore we should spend huge amounts of public money on it, but, you know, it does mean that people like trains for more reasons than their insidious collectivist promotion. Manypeoplehave, for good reason, taken their knocks at syndicated columnist William F. George’s ludicrous column about trains, with particular emphasis on the substantial amount of government subsidies that facilitate “individualistic” car travel. In addition, I’d note that the flying experience is a good example of Republican “freedom.” For some distances flying is of course necessary and useful, although a good high-speed train network would reduce the number of routes that make flying more practical. For the ordinary person, however, flying is a miserable experience — more waiting in line than a Soviet supermarket during a recession, the potentially humiliating security theater, and incredibly cramped and uncomfortable travel. But — and here’s the rub — people as affluent as Will can buy their way out of the worst aspects of flying, with separate security lines, private lounges, and first-class seating. With trains, on the other hand, the experience for the ordinary person is infinitely superior but the affluent can obtain an only marginally better experience. So you can see why Will hates it. The fact that trains might represent more meaningful freedom for you isn’t his problem. Some of the comments on my various pro-train posts have been along the lines of “Oh yeah, try taking the train to Los Angeles.” But that, of course, misses the point. Suppose that I put those fixed costs at 2 hours; suppose that planes fly at 500 miles an hour; and suppose that we got TGV-type trains that went 200 miles an hour. Then the crossover point would be at 667 miles. It would still be much faster to take planes across the continent — but not between Boston and DC, or between SF and LA. Add in my personal preference for train travel, and I might be willing to train it to Chicago, maybe, but not to Texas. I endorse Krugman’s analysis, but in some ways I think the fact that you can’t get to LA on a train actually is the point. You can’t take the train from New York to Los Angeles. You can’t drive from New York to Los Angeles. You need an airplane. But LaGuardia Airport has limited runway capacity and many daily flights to Boston. Clearly, though, you can take a train from New York to Boston. So money spent on improving the speed and passenger capacity of NYC-Boston train links is, among other things, a way to improve New York’s air links to the West Coast. Now a separate question is whether there’s any feasible way to actually do this in a country that doesn’t have a French (or Chinese) level of central political authority empowered to build straight tracks through people’s suburban backyards. The answer seems to be “no,” but the potential gains from greater rail capacity in the northeast are large and would (via airplanes) spill over into the rest of the country. Thinning air traffic in the Boston-New York-Washington air corridor has acquired new urgency. Read Malcolm Gladwell’s New Yorker essay on the deadly dialectic between the technological advances in making air travel safer and the adaptations to these advances by terrorists. The lesson to be learned is not defeatism. Security improvements can steadily complicate terrorists’ tasks and increase the likelihood of defeating them on the ground. However, shifting more travelers away from the busiest airports to trains would reduce the number of flights that have to be protected and the number of sensitive judgments that have to be made, on the spot, quickly, about individual travelers. Congress should not adjourn without funding the nine-state Midwest Regional Rail Initiative. In his recent screed against rail, Will explicitly dismissed arguments that it would be good for national security. He also didn’t mention air travel. Maybe that would have reminded him of what he himself wrote nearly 10 years ago. Good get, but if we’re going to be talking about stupid ideas people had right after 9/11, we’ll be here all day. Will’s rail fetish was a passing fancy, and since then he’s come around to the conservative consensus that rail can never, ever work as a replacement for air travel, so rail projects are essentially boondoggles. This is an odd discussion to have as the Atlas Shrugged movie comes out. The book and the film absolutely fetishize rail; the film makes it clear that rail will become necessary once gas starts to really run out. And this is something liberal rail adherents point out, too. But I don’t see conservatives coming around to HSR, which needs a massive manpower and financial and land commitment to get going, outside of that sort of crisis thinking. This isn’t to play “gotcha,” as much as it is to note a simple fact about our world: We’re all partisans, whether we admit it or not. Reason’s opposition to the individual mandate has almost nothing to do with the substance of what is truly a center-right policy and everything to do with current political circumstances. The mandate was implemented by a Democrat. Reason, as a right-libertarian institution, is part of the conservative opposition to the liberal president. Likewise, Will’s opposition to high-speed rail is purely a function of partisan politics. This isn’t a bad thing. Yes, partisanship can be taken too far and veer into ideological blindness, but, in general, it is a useful way of organizing our thoughts on policies and politics. Indeed, it’s how most voters process political information. Political commentary would be much more bearable if pundits were willing to accept the partisan origins of their biases and skepticism, instead of playing a game where we pretend to be open-minded observers. Most are anything but. Mr Bouie might be overstating the influence of partisanship a bit, and it’s hard for people to know exactly what is driving others’ opinions—or even one’s own. Still, partisanship is certainly a useful frame through which to view both the most ardent opponents and the most passionate defenders of HSR. There is political science research that shows that a president weighing in on one side of a given debate (as Barack Obama has with high-speed rail) dramatically increases political polarization on that issue. Of course, if Mr Bouie’s theory is correct, we should be able to point to some lefty supporters of HSR whose support seems to be driven primarily by partisanship—or even a few who, like Mr Will, have switched positions on the issue. Anyone have a nomination? Let us know in the comments.